The recent Ronald McDonald House Charities Day of Change held on Saturday, October 15th was a huge success. * Contributions greatly exceeded those normally made through the on-site Donation Boxes on a typical Saturday. 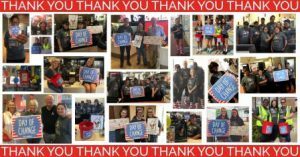 We’re so thankful to all the McDonald’s local Owner/Operators, crews and customers who supported Ronald McDonald House Charities of Alabama on Day of Change (and all those who continue to do so all year long). Thank you to all the communities throughout our state who did their part to celebrate with us. We could not have done it without each of you. A big shout out to our volunteers who helped out, too! Don’t forget that you can celebrate anytime you go to your local McDonald’s. Donation Boxes are at the cash registers and the drive-thrus at most McDonald’s and any donations to those boxes support the Ronald McDonald House in your area. You can also purchase Happy Meals to support the charity — a penny from each Happy Meal is donated back to RMHC. It is because of your support that we can continue keeping families close. *Since Donation Boxes are only emptied once a month or when they become full, we began with change already in most of them on our Day of Change. This makes it impossible to only tabulate donations for that day alone. However, we can report that the boxes have filled up much more quickly this month than normal.